May | 2010 | Adventuring Towards . . . They woke me up for breakfast, a veritable feast of leftovers. I think they’re still going to be eating jiaozi for a few days, which means they won’t forget me right away! Xiao Zhang went to work but Xiao Li and I went back to sleep in her bed (and by bed, I mean floor). We didn’t get up until after 9, which was such a ridiculous hour for her that she kept bringing it up all day long. We went for a walk through town, buying ingredients and other things along the way. I bought a pair of split-bottom pants for some friends who are expecting a baby, and a super-hot pair of pink Louis Vuitton leggings. You know you want some! We had a big lunch, our last together, then they took turns sitting and talking with me. I got a picture of Xiao Zhang wearing the TU shirt we gave him two years ago! Then I was on a bus headed to Yanji. It was just like last Friday – only the exact opposite. The power plant was the last familiar thing I saw, and I hated to watch it recede behind me. The trees still pointed relentlessly, but now they were pointing in the same direction as I was traveling, urging me onward and homeward. Even my mood was the opposite – no longer excited, maybe a little melancholy. But I couldn’t be too sad. I had such an amazing trip, that even its inevitable conclusion can’t ruin my happiness. I was worried, before coming, that maybe I had planned to stay too long, that maybe everyone wouldn’t be as excited to see me as I was to see them. That did not turn out to be the case, though! I’m glad that I seemed to make my friends as happy as they made me. They say you can’t go home, but apparently you can in China. See, I’ve decided that, while I have grown up in Fujian, I was born here in 东北 (the northeast). After a two-hour bus ride, I arrived in Yanji. Yanji is the nearest big city to Hunchun, the closest place to find an airport, university, or McDonald’s. It’s also the capital of the Yanbian Korean Autonomous Prefecture and is even more Korean than Hunchun. I have some friends in Yanji, so I took a taxi to their place where I got to catch up with them. Hilarious – and spot on! They took me to Gina’s Place, a Western restaurant, for dinner. I had garlic bread, chicken quesadillas, and cheese cake, all of it heavenly. Then, all too quickly, it was time for me to go. I had a 9:30 train to Jilin, and made it just in time to get on board, find my berth, and fall asleep. Making jiaozi is like Thanksgiving, at any time of year. We made a few hundred last night, which meant today’s breakfast was jiaozi and it looks like tomorrow’s will be too. Eating jiaozi dipped in a mixture of soy sauce, garlic, and hot – alternating with cookies and milk – at 6 a.m. didn’t even feel that weird. It felt . . . delicious. They went to work and I went to church. Everyone on Sunday had welcomed me back any day, so I took advantage of the proximity of the church here (and the fact that I was already out of bed) to go to daily Mass. As soon as I opened the door, I knew something was different – the sight that greeted me was 50 black heads covered in white veils, and the sound that greeted me was not Mandarin. It turns out that today’s Mass was in 朝文, [North] Korean. Huh! I was helped by the Korean/English missal that a sister passed me, and by the fact that the readings (and even the homily, I think) were all read twice, in both Chinese and Korean. Nothing makes a foreign language sound familiar and comforting like another, more foreign and even less familiar, language! I mainly read everything to myself throughout Mass (although one of my approximately 10 Korean words, “komapsumida” or “thank you” did come up several times! ), but I found it a little weird to read the English Mass after so long so sometimes I recited the Chinese to myself. I think it takes a long time to say stuff in Korean, because sometimes I had time to do both before the priest caught up with me! This has been an interesting week after Pentecost, including Mass in two languages (neither of them my native language). The story of Pentecost is the descent of the Holy Spirit on the Apostles, filling them with gifts including the ability to speak in tongues and be understood by all who heard in their mother tongue. Unfortunately, this gift has yet to manifest itself in my presence, but I have, throughout my life, witnessed the proclamation of the Word to many different peoples. It’s just the work of many to do this, the task of each particular church. It’s also super cool. After Mass (and after the stream of Koreans greeting and thanking me subsided), I went off in search of a place to wash my hair. I love staying at the Zhang’s (call me a sucker for a heated floor) but the bathroom situation is a little less than ideal – as in, I don’t believe there’s a towel larger than a washcloth in the entire house. Luckily, China offers cheap alternatives to showers, so I just went to a small, slightly sketchy, hairdresser and had them wash and blow-dry my hair for 10 kuai, or $1.50. I went to peruse the mall after that, when a woman caught my attention by guessing correctly that I’m American, not Russian. She was a manicurist and, as I had torn a nail the other day and hadn’t brought a nail file up north with me, I sat down for a manicure. Despite paying double price for a French manicure (10 kuai! ), it was still cheaper than buying a nail file in America. Plus it came with an hour of oral Chinese practice! 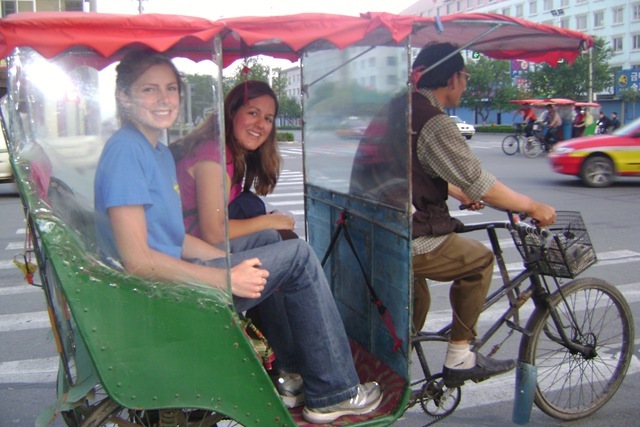 Sanlunches (pedicabs or, literally, “three-wheeled vehicles”) are way cooler than taxis because a) the view is better, b) they only cost 2 kuai instead of 5, and c) Xiamen doesn’t have them. I met the Zhang’s at the place they’re working, then Mob Boss and his wife picked us up from there. No one wanted to make the decision of where to go, so when Mob Boss finally tossed out the idea of dog, I agreed. We went to “Hunchun’s best dog restaurant”, where we ordered a plate of dog, a plate of beef, two eggplant dishes, and potato cakes. The dog was a little bit better than last time – the hot sauce helped a lot! – but the texture is unmistakable in a not-so-good way. Eating dog I can handle, but some things at lunch still threw me off. The second time our waiter came in, they asked me if he was 帅不帅, good-looking or not! Okay, I’ll admit he was good-looking and the thought had crossed my mind, but . . . I couldn’t say no because that would be both rude and a lie, and I couldn’t say yes because we just don’t say things like that! I settled for hysterical laughter and a bright red blush. Well played, Maria. After that, we got into a thorough discussion of my finances – how much and from where – that stopped only because I don’t know how much my dad makes. It’s interesting – if there were a trivia contest between them and my friends back home and “Maria’s Finances” were a category, they would win. Americans just don’t ask those questions . . .
One good thing about this discussion is it apparently convinced them that they could let me pay for lunch. I had invited them (with the obvious implication that I would pay) but they still jockeyed for the bill. This was my first real battle over a check here, and I’m proud to say I won. Dog for 5 = 160 kuai. Beating a Chinese man at 请客 = priceless. We dropped Xiao Zhang off at work, and then they took Xiao Li and I out. It was my last day in Hunchun and they wanted me to 好好玩, or have a good time. We headed towards 防川 (the place where Russia and NK cut China off from the Sea of Japan) but stopped along the way at some sand dunes. Yes, Hunchun has no ocean and is covered in snow 5 months out of the year, but they have sand dunes too! We took a bunch of pictures (with his camera, though, so I’m still waiting) and I laughed so much that my cheeks hurt. What a great last afternoon! Back in town, Xiao Li took me to buy some things I need to cook Chinese at home – jiaozi sticks, enormous strainer/spoon, and garlic press. Then we walked through town towards home, stopping along the way to visit her friends. I found it really interesting that all of her friends (plus my manicurist) where Christian and showed it pretty obviously. This is a pretty big difference from Xiamen, where the only Christians I know are either foreigners or friends I met at church. At one friends’ store, while they were discussing the differences between Chinese and American food, I burst out in uncontrollable laughter. The discussion – “they eat bread and drink milk” – is nothing I haven’t heard a hundred ten-million times, but this time it struck me as particularly funny. I had this mental image of our family gathered around the table, upon which is set a single loaf of bread and a pitcher of milk. We look around for the rest of the food, but there’s nothing – just bread and milk tonight, again. Maybe Americans make generalizations as much as Chinese and I just never noticed it, but I seem to have taken on refuting incorrect assumptions (especially about foreigners) as my personal task this year. At the same place, I took another step towards assimilating into Chinese culture! They asked how old I was, and instead of going into the discussion of whether you’re 0 or 1 when you’re born, and therefore whether I’m 22 or (gasp!) 23, I just said I was 八八年, or born in 1988 and let them figure it out. Personally, I’m annoyed when other people make me do the math, but they don’t seem to. This way seems more efficient in China, so maybe I’ll make it a habit. Back at home, Xiao Zhang showed me how to make 拔丝地瓜, sweet potatoes in caramelized sugar. We had that and beef-‘n-ginger for dinner, then walked to the night market for dessert. Yes, tonight was the night I finally ate silkworm. Having heard that they’re good from Xiao Zhang, ZaiBin, and Timothy & Naomi, I decided I couldn’t put it off any longer. Verdict? Not the worst thing I’ve eaten. (Although honestly, I say that about everything. I’m not sure what I would say is the worst thing I’ve ever eaten!) They were grilled to a crisp, leaving the inside still mushy. The texture was fine (although, I’m not gonna lie, finding a bit of shell in between my teeth later was more than a little nasty) but I didn’t care much for the taste. At this point in my culinary adventures, eating something is no big deal. 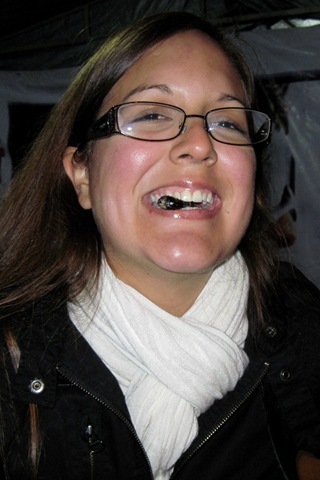 The big deal is that, after getting one silkworm down, I had another one. 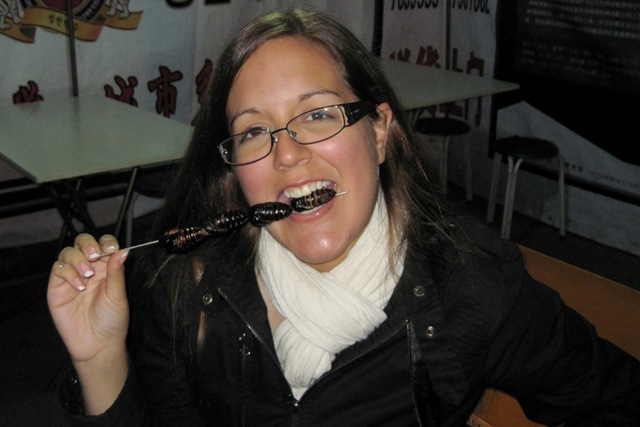 (There were four on the skewer, Xiao Zhang only wanted two, and I don’t like to waste food!) Also, I didn’t have anything to wash it down with, which I think is pretty amazing. Go me! Xiao Zhang didn’t seem so happy at the night market. Maybe he’s just tired, but I wonder if he’s also sad that I’m going. I know I am . . . and although my Chinese has improved a lot, I still can’t fully express how I feel. I woke up at 8, which around here is pretty much midday. Because the entire country is on Beijing Time, the sun rises here around 4:30 in the morning – the first place in China to see the sun – and that’s when a lot of things start on the farm. This unfamiliar schedule certainly does not help when suffering from jet-lag after a 24-hour journey over a 13-hour time difference, but I’m finding it disconcerting even compared to the rhythm of days in Xiamen. I brought a whole bag of food up here, goodies from America or Xiamen’s Metro that are difficult to find even in Yanji. As of this morning there was just one bag of chocolate chips left, so I made cookies. They turned out NQR (Not Quite Right) but I blame that on the NQR butter, NQR flour, or NQR oven and not on myself. They tasted good, at any rate, so who cares what they look like? Not the kids, apparently! We had cheese sandwiches for lunch – the same as yesterday and the day before – but let me tell you, after 9 months in China, I just can’t get enough. There was mozzarella cheese melted between the bread, feta oil for dipping, and a new kind of Russian cheese to spread on toast. Also, there was milk – good milk – to go with the cookies! Dairy, where have you been all my life these last nine months?? In the afternoon we walked over to the dairy barn so I could visit the milk lady and milk man. I brought them some cookies and sat with her for a little while. They’re from Inner Mongolia, and she has a pretty heavy accent. It’s just another reminder that, no matter how good my Chinese gets, there will always be some Chinese with whom it is hard or impossible for me to communicate. But we had some nice comfortable silences . . . The taxi came at 3:30; I ended up packing in a rush and didn’t remember to say goodbye to the farm until I caught the last glimpse of it out the window. Bye-bye, farm, see you next time . . .
Lyte and I went into town to Xiao Zhang and Xiao Li’s place, where we were going to learn to make 饺子, the Chinese version of ravioli. I was hoping to help Xiao Li make it from scratch, but when we got there the wrapping and inside were already made. As I feared, she explained it with a list of ingredients and not a single measurement for reference. Ugh! But I got to help her run the dough through the noodle press, cut it into circles, and then 包 the jiaozi, putting a spoonfull of filling in each circle and folding it snugly. Xiao Li is a jiaozi ninja, but I did much better than last time, when at least half of mine fell apart upon contact with the table. We made over 200 (nothing compared to last time, though, when we made over 600!) and were joined by Timothy, Naomi, and the rest of the kids to eat them. 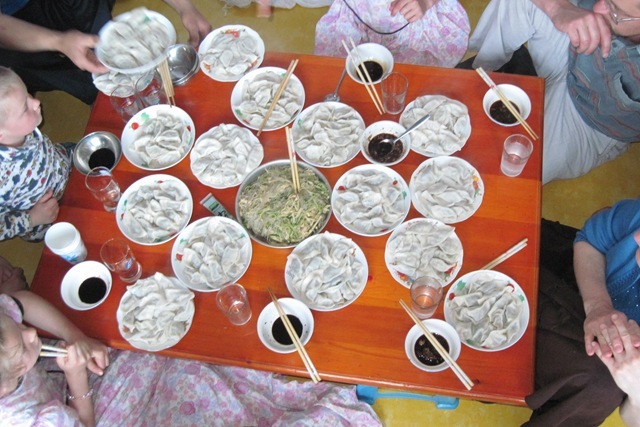 The entire table contained nothing but plates of jiaozi and bowls of soy sauce and garlic. It was an epic feast. The family went home after dinner. I don’t know if I’m going to see them again, so we said our goodbyes. 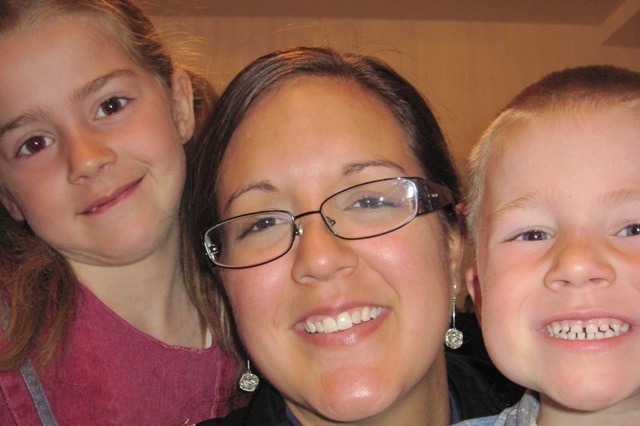 I got hugs, kisses, and promises to remember me from the kids, and a smile and a blessing from Naomi. I can’t say how much of a joy it has been to know them these past few years, and I sincerely hope that our paths will cross again in the future. Xiao Zhang, Xiao Li, and I finished watching the evening’s TV show and then Xiao Li went to bed. Xiao Zhang and I talked for a little while before he said goodnight, about my future (both in terms of school and boyfriends). He wants to know when I’ll be back to China, back to Hunchun. Join the club, Xiao Zhang . . . I wish I knew, I wish I could put a date on it, I wish I could make promises that I could keep, I wish I could make plans I could count on. But I can’t. This is the first time I will leave China without a pretty clear idea of when I’ll be back, and to where. Honestly, I have no idea. I don’t see it being next summer, but I am so obviously not in control of my own life that my word on this counts for nothing. Xiao Li joked earlier about me taking her home with me. It would be great – she could cook for me! – so I said that I would take her in my ‘xinli’. This caused a little bit of confusion, as no one (including me) was sure whether I had meant 心里 (in my heart) or 行李[里] (in my luggage). We carried the joke further, discussing what I would do when the customs officer saw her in my luggage (I, true Chinese that I am, said I would offer a bribe). But seriously, I will carry these people back to America with me in my heart. It would be so comforting – to them and to me – if I could put a date on my return . . . but as I can’t, this will have to do until then. Ah, now I remember: THIS is what I came up here for. Well, besides, the friends, food, and memories. But seriously, it was great to God to send such a morning on my last full day at the farm. I sat outside with the kids while Naomi read out loud, then went for a walk by myself. The road was still torn up from the last few days of rain, so it was slow going, leaving me a lot of time to think. I spent most of that time sorting through the emotions I felt as I approached my destination: the SSR. The Sustainable Shepherd’s Residence, or SSR, is a prototype of a sustainable shelter for a shepherd and his animals. It was the main project of the SENEA team on the farm, involving several forms of sustainable energy to power the house off the grid. The factors that make this sort of residence necessary are many – economics, climate, physical health, energy independence, property rights issues, etc. When we came in the summer of 2008, the SSR was just an SR – a shepherd’s house with an adjoining open barn for the sheep. During our time here, we worked on a greenhouse, biogas digester, solar oven, and three wind turbines – all components of the sustainable residence. 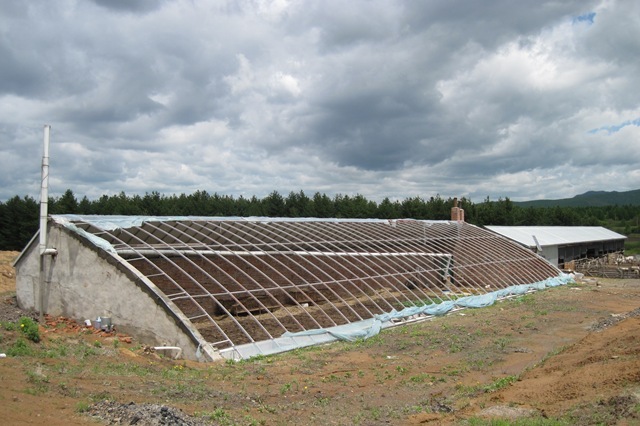 Since our time here, the greenhouse was finished but the biogas digester has sat untouched, the solar oven washed away, two of the turbines are broken, and one is unfinished. It’s hard for me to think about, and harder yet to see. A relationship with the project site is key to the mission of SENEA and, each time we left, it was my comfort. The work was never done and the projects were never perfect, but because of the relationship we knew we’d be back to continue what we had started and improve what we had done. It wasn’t failure, it was just a chance to try again next time. But somewhere along the line the relationship grew so strong that even after the project stopped, I find myself back here at the site as a witness. It hurts. I know what happened during our time there, how lessons were learned and relationships formed and lives changed, but . . . the material legacy is not impressive. We had a picnic lunch out in the front yard – amazingly good homemade sandwiches, apple cake, popcorn, and fresh milk. I felt a lot better after talking to Timothy, discussing the success of the project from another perspective. Then I took a taxi into town to meet ZaiBin and the other Americans who work with him now. We had coffee (well, milk tea for me) and talked for a long time. We had some downtime, so ZaiBin took me to look at cell phones. After about 5 months of wanting a new one, I finally bought a cell phone to replace the one someone gave me after I lost my first one! It can play music, take pictures (and video, I think), get on QQ, etc., but I’m most excited to be able to text in Chinese more easily. It was $50, but it’s quite a deal for a brand name phone – Mokia. No, I did not spell that incorrectly . . .
For dinner, I treated everyone at 天仙包饭, a.k.a. Cellphone Restaurant, a Korean place. In addition to me and the farm family, I invited Xiao Zhang, Xiao Li, ZaiBin, and the wife and son of our taxi driver that summer. It was good to have such a rowdy crowd for dinner, plus the food was delicious and ample but only cost 270 kuai ($40). It’s my last night on the farm until I-don’t-know-when. I had a delightful late-night (until 9) conversation with Naomi, and then retired to my room. This morning I finally had the opportunity to explore the farm. I took the four oldest kids for a walk down to the cow barn, up to headquarters, and back – a twenty-minute walk that took over an hour because of my small walking buddies. It had finally stopped raining, and the farm had that shiny look of something that God just power-washed. The blues were especially blue, the greens especially green, and the whites looked like something out of a laundry detergent commercial. The air out here is so clear that you can see the Hunchun power plant, 20km away. In Xiamen, where most people say the air is pretty good, most days you can barely see Gulangyu! 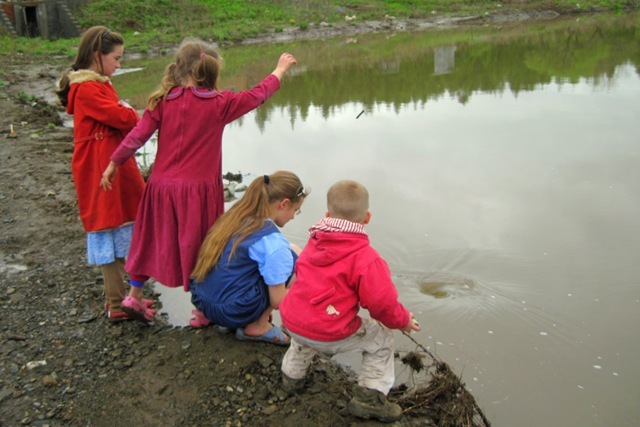 The kids even sensed something special in the air, continually pointing out things that they see every day and exclaiming over how beautiful they were today. I think the farm is one of the most beautiful places I’ve been in the world, and it was nice that they seemed to agree. Despite the mud, the kids kept pretty clean until we got to the bridge. At that point, their desire to chuck various objects into the water and watch them come out the other side overpowered all else . . . Sorry, Naomi, I tried! I had a taxi to catch when we got back, so the girls made me a sandwich to-go. Homemade mozzarella cheese from their cows on homemade whole-grain bread, fried in butter from the same cows and served with homemade marinara sauce . . . aaaaaaaaaaaah. I’ve tried the 5km Diet, and it is good. 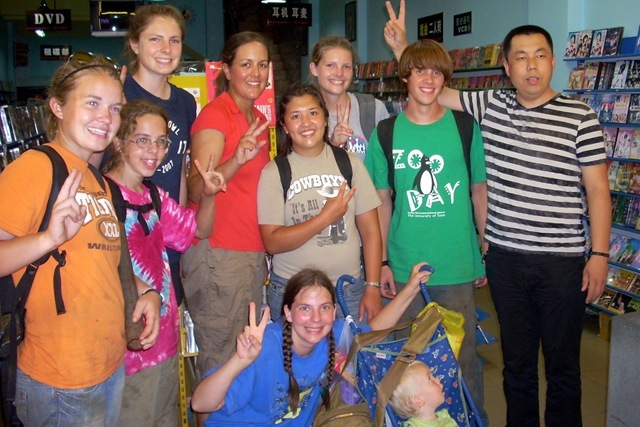 I got dropped off at Crazy Mart, where I met up with my very first Chinese friend. ZaiBin was the only Chinese person that I actually interacted with on my first (8-day) trip to China. 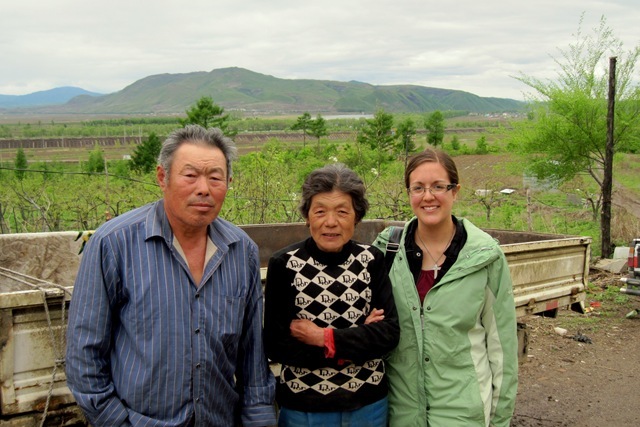 He had been working as the driver for an American horse farmer here, and knew enough English that I remember a conversation with him about the persecution of Christians in China and North Korea. His English has gotten better on each successive visit, and after the rapid improvement my Chinese experienced since last time, we’re able to switch quite freely between the two languages. We went to lunch first, eating bibimbap (and chicken wings) at a Korean restaurant. Bibimbap is one of the foods that I fell in love with here in Hunchun, but after having it in Tulsa and Xiamen, I wondered if I had remembered liking it incorrectly. It’s just not that good . . . anywhere but in Hunchun, that is. 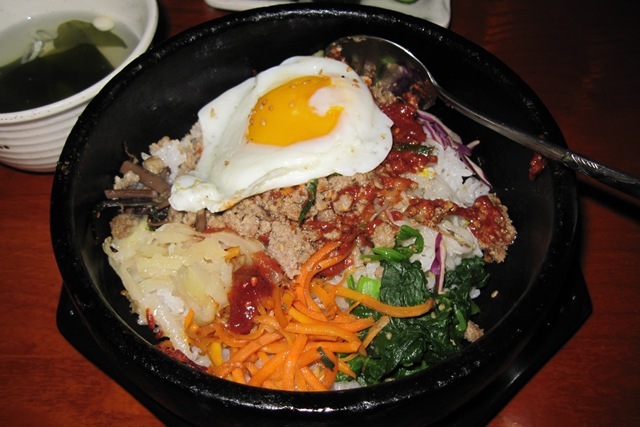 Dolsot bibimbap is a mixture of rice, meat, vegetables, and a fried egg, served in a freaking hot stone bowl. Kind of like fajitas, it is served to you still dangerously hot; you stir up the mixture while the bowl continues frying the egg and cooking the rice to a delicious crisp. I 请-ed him to eat lunch, so he 请-ed me to drive me somewhere. 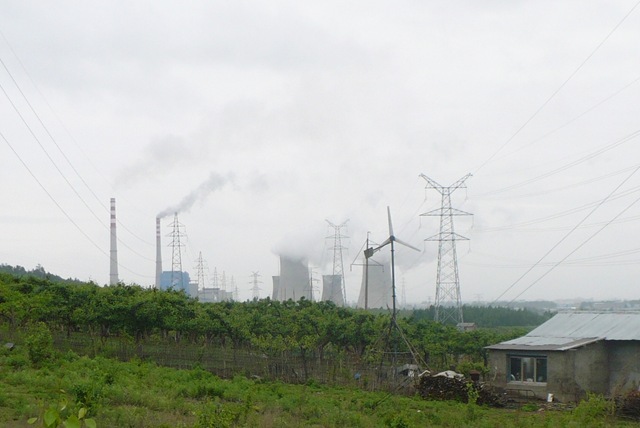 I immediately knew where I wanted to go – a small house nestled in the hills directly next to the Hunchun power plant. Having already taken me there several times, he knew the place I was talking about, and we set out. 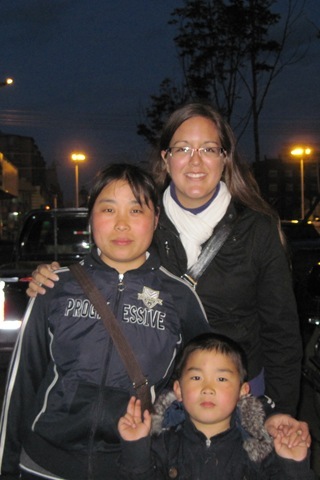 I first met Goose Lady nearly three years ago, on my first trip to China. ZaiBin said he knew of a woman who was living off her wind turbine, and took us to check it out. What we saw there, captured in the picture above, came to define for me what our project was all about. This woman, despite living a stone’s throw from this enormous power plant and in the shadow of its high-voltage power lines, was not connected to the grid. Instead, all her electricity came from the small wind turbine above her house. Small-scale, economically profitable, locally sourced appropriate technology offering freedom and improved quality of life? Check, check, check, check, check, and check. On subsequent trips to China, I have visited Goose Lady. It’s a sort of pilgrimage, visiting her home in homage to the ideal of sustainability that she’s living. Plus, they grow apple-pears (which are more delicious than either apples or pears), and she always gives me some. Plus, I have to update her on the geese she sold to Timothy on that first visit (hence the nickname). She echoed the comments of everyone else I’ve seen on this trip – my Chinese is way better, and I’m thinner (really?? That’s what they say . . . ). She said I’m a 大孩子了 (a big kid now), and that I’ve 长大了 (grown up). Even having the language ability of a Chinese 10-year-old is better than the infant I was last time, so we were able to have a good conversation. ZaiBin took me home to the farm, where I played with the kids until dinner. 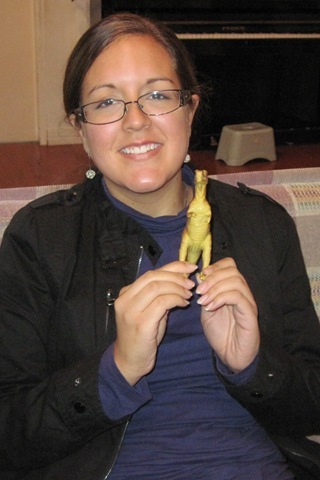 The main task was assigning every dinosaur a name from the summer 2008 SENEA team. From left to right: Brittany, Josh, Blake, Alli, Sarah, Caitlin, Michelle, Tanner, and me. It was a cold rainy day in Hunchun and I was comfortable under my heavy mink blanket, so I slept past 8. When I got downstairs, the kids were doing some schoolwork with Naomi, and I watched Lyte work on phonics. He read bed, set, ten, and pen all by himself, and the look of wonder he had on his face reminded me of the time he learned what an eraser was for. Named after me because the resemblance is striking, no? Truth, the boy who was born during my second stay at this house, has finally warmed up to me. I remember him as a tiny newborn and saw him again around 6 months, but he obviously had no recollection of me. But we roughhoused a little bit today and I finally have a name: ‘ia. Close enough, I say! We cuddled while we listened to Miriam read aloud to us. Around 11 I called a taxi to take me into town. I went to HuoMen Light Fixtures, where Xiao Zhang and Xiao Li were working, and hung around there until they got off work. The sound of the chopsaw tearing through steel, the distinctive flash of welding, and the overpowering scent of shop made me really nostalgic. The two years since my summer on the farm have not been nearly hands-on enough, but I was instantly reminded of the desire I once had to go to welding school. Turns out the desire’s still there . . .
At 11:30, Mob Boss and his wife picked us up in his fancy (new!!) car to go to lunch. Allow me to introduce Mob Boss – Chinese name 王洋. He’s the owner of a DVD shop in town – our favorite DVD shop, as it was a short walk from Crazy Mart and the only place in town to buy a 16-disk set of 100+ Disney movies for $20. We went there almost every night we went into town, and between the dozen of us usually spent a few hundred kuai. One time we went, Mob Boss was there and, between the novelty of having foreigners in his store and the amount of money we had spent there, took a liking to us. He took group pictures of us and printed them out for us. He started driving us home in his really nice car after our visits to his shop. This is how he got his nickname – that kind of car does not come from a small DVD shop, at least not before we started patronizing it. We figured it was a front to some shady dealings, so we dubbed him Mob Boss. When we left, he gave me a business card and instructions to call him when we came back to town. So . . . I did. Four months later when I came back on another assessment trip, I braved the terror that is making phone calls in Chinese and called him up; he gave us presents and drove us home. Somewhere along the line he’s moved up from a DVD store owner to a friend, and on this trip back, he was definitely on the list of people I wanted to see. All the people I know in Hunchun know each other (cause or effect? ), so it shouldn’t have been surprising that Xiao Li and Mrs. Mob Boss know each other, and the five of us made a date to go to lunch. We went to hot pot, possibly my last time during this year in China (as the weather for this has long since passed in Xiamen but is still in full swing in Hunchun). They ordered way more meat than we usually do, plus a new broth, some great tofu, and a kind of 饼 (pastry?) that I’ve never had before. There was rousing conversation throughout the meal, more than making up for the 3 hours of Oral class and 3 hours of Listening class that I’m missing during this trip. After lunch, we took Xiao Zhang and Xiao Li back to work and I went with the Mob Bosses to her store. 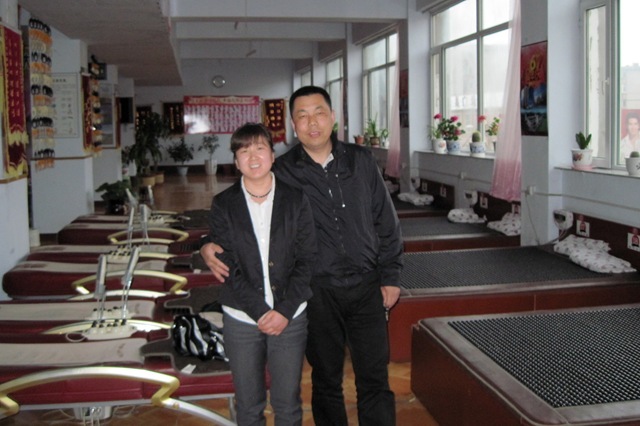 She sells beds – special heated beds, bed with massage, beds that have healing powers. This may help explain the car, haha! We went into her office, where they insisted that I rest on one of their heated beds. Well, if you insist . . . it was quite pleasant, to say the least, and I awoke about three hours later feeling well-rested and only a little bit guilty. They closed at 5, then we made the rounds of town in their car, picking up things for dinner (including Xiao Li). We snacked on strawberries and nuts and wine while he cooked, then feasted on steak, enormous crab (that tried, but failed, to walk out of their pot), bean sprouts, egg-‘n-onion, fried tofu, and sugared tomatoes. Basically, I haven’t been un-full since lunch! Dinner’s conversation was even more interesting. Xiao Zhang and Mob Boss are really pushing the idea of me finding a Chinese husband. He’ll cook, they say, and his mother can watch our kids. Maybe on the next trip, I say . . .
Also, we discussed the etiquette associated with hosting in our cultures. They have the idea that Americans aren’t very good hosts, but I said that it’s just a cultural difference – and that sometimes the behavior of Chinese hosts can come off as too strong. Sometimes it feels like coercion, I said! They really seemed to understand, and thereafter actually listened to me when I said I couldn’t eat any more! Mob Boss drove me home to the farm afterwards, but the gate was locked so I had to walk the last part by myself. 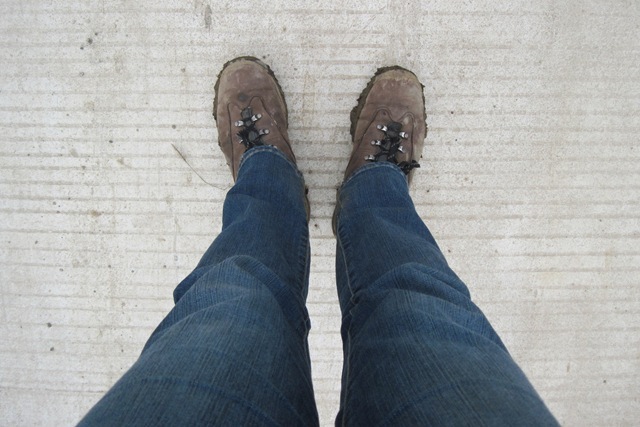 It was a special feeling, picking my way carefully over the familiar path, dodging unfamiliar potholes and puddles. The warm farmhouse ahead of me with a single window illuminated, and a car full of friends behind me. I was alone – alone enough to hear the sounds of night life on the farm – but I knew that with a single phone call, Xiao Zhang would run to my side. But I made it home fine by myself. How could I get lost on memory lane? You just walk around the new gate, pass the workers’ house, go under the bridge, walk by the ditch we pulled the taxi out of, turn right at the bridge I drove the motorcycle off, and you’re home! From a short assessment trip to China three years ago, to what occasionally seems to be a year-long crash course on Catholicism in China, it’s been an interesting path. At that time, I can’t say I was really aware that the Church was in China; now I find myself a daily witness to its existence. The other night at DongFang, I met a friend of some friends of my friends, and ended up telling him a little about my experiences with the Church in China. Like so many foreigners, he had no idea about the situation here. There’s misinformation and, to a certain extent, prejudice and assumptions that prevent us from knowing the truth: what is it like to be Christian in China? My experiences are not authoritative, but I’m glad to share what I know. There is good news: the Catholic Church is here, with consecrated priests, beautiful churches, valid sacraments, and [some] legitimate bishops. Chinese bibles (printed by the Patriotic Associations but, as far as I can tell, completely normal) are available, and most bookstores sell compilations of Bible stories. 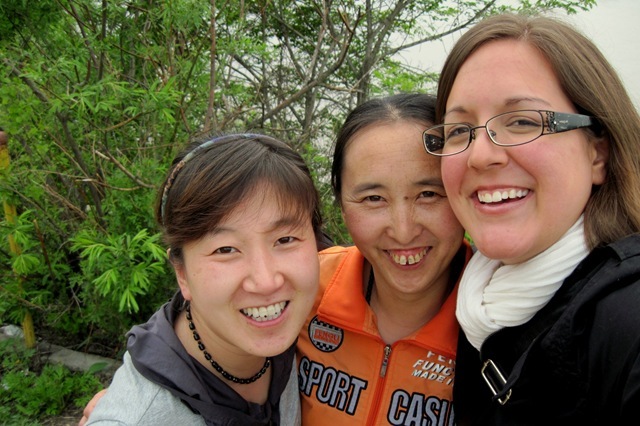 In registered churches at least, foreigners and Chinese can worship together. Even some house churches – sometimes with thousands of members – are tolerated by the authorities and allowed to operate relatively openly. The freedoms that Christians enjoy are enjoyed at the whims of the government. Some house churches are tolerated; others have their buildings razed and their leaders arrested. Some bishops are recognized by both the government and the Vatican; others have been missing for months and even years. The Bible is available but the Diocese of Hong Kong’s website is usually blocked. There’s a beautiful cathedral to Mary, Help of Christians at Sheshan in Shanghai but they’ve imposed restrictions on pilgrimages during the Marian month of May. It’s all a balancing act, in which the government tries to figure out which is going to be more of a hassle – letting the Christians do want they want, or dealing with the rest of the world if they don’t. I know all of that, but what resounds most in my personal experiences is the isolation they experience. The isolation of the mainland is impressive – in many areas, but especially Christianity. The internet is censored; the Cardinal Kung Foundation website and biblegateway.com are blocked (in fact, after a few such sensitive searches, all Google searches on my computer seem to be blocked). But even when sites are accessible and available in Chinese (like the Vatican’s website), they’re often in traditional characters. The PRC is the only nation that uses simplified Chinese characters, which has made it very hard for me to find texts that I can read. Another thing I’ve noticed is the divisions brought about by differences in vocabulary, maybe caused when missionaries of different denominations did their own translation. The books of the Bible are different for Christians and Catholics, and the two even call God by different names (天主 for Catholics and 上帝 for other Christians). Perhaps because of this, Christianity and Catholicism are viewed as two mutually exclusive religions, instead of closely-related subsets. Catholics in China are not only divided from Catholics throughout the rest of the world, but they also seem largely deprived of fellowship with their fellow Chinese Christians. And then there is the internal disunity in the Chinese Catholic Church, the tension between the underground and patriotic churches. I haven’t witnessed this too much, but I have on occasion seen some scorn surface when discussing the patriotic church. This ostracization is another source of isolation, especially for Chinese bishops who are trying to maintain good standing with both the government and the Vatican so as to better tend their flock. What I’m trying to say here is, there’s a desperate need for unity in the Church in China. I believe that government control and divisions imposed from without are no match for mutual love and understanding, humility and forgiveness – and prayer. Virgin Most Holy, Mother of the Incarnate Word and our Mother, venerated in the Shrine of Sheshan under the title “Help of Christians,” the entire Church in China looks to you with devout affection. We come before you today to implore your protection. Look upon the People of God and, with a mother’s care, guide them along the paths of truth and love, so that they may always be a leaven of harmonious coexistence among all citizens. . .
Our Lady of Sheshan, sustain all those in China, who, amid their daily trials, continue to believe, to hope, to love. May they never be afraid to speak of Jesus to the world, and of the world to Jesus. In the statue overlooking the Shrine you lift your Son on high, offering him to the world with open arms in a gesture of love. Help Catholics always to be credible witnesses to this love, ever clinging to the rock of Peter on which the Church is built. Mother of China and all Asia, pray for us, now and forever. This morning, Xiao Zhang and Xiao Li let me ‘sleep in’ after they went to work. This meant I got to wait until the luxurious hour of 7 a.m. before getting up to go to Mass. I arrived just as the congregation was starting their pre-Mass prayers. It’s nice being in the northeast here, because even their personal prayers are in Mandarin (as opposed to Xiamen, where they use Minnanhua). The church here is rather small and it wasn’t packed, but there were probably 40 or more of us. The priest was very young, and the general makeup of the congregation seemed younger than at my church in Xiamen. Today is the Feast of Pentecost, the end of Easter and the anniversary of the beginning of the Church. The first reading was about the descent of the Holy Spirit upon the Apostles, causing them to speak in tongues so that everyone listening heard them in their own native language. All I could think was, wouldn’t that be neat! After Mass, there were a number of people interested in talking to me. It may be the circles I run in here, but it seems to me that there’s a well-established network of house church communities here in Hunchun, and not many tourists, so I think they don’t get many foreigners joining them. One woman had been particularly helpful during Mass, helping me find the hymns and such, so I sought her out. My memory isn’t super clear, but I think it was her who was here that Sunday afternoon when I first walked by and noticed the steeple. There was another woman, tiny and unbelievably old, who came up to me and, grabbing my hands between hers, bowed repeatedly and thanked me. Someone else introduced her as a North Korean. I don’t think I’ve ever met anyone who was happier to see me; personally I was torn between the largest smile my face could hold and tears. A third woman took it upon herself to make sure I got where I was going next. I had time to kill so she took me watch-shopping and we grabbed breakfast. She was young – 48? – and retired after working in the mines. In the afternoon, we headed back to the farm. The entire taxi ride was familiar to me – ring road, the gas station, the courthouse, Taiyang village, castle house, the little pink building, and finally the house! The house is just as I remember it as well, except – get this – they have internet all over now! When I was a kid . . . I put my stuff up in my room and then got right to work baking a cake. Today happens to be one of the girl’s 11th birthday, so I was really glad I brought so many ingredients up! 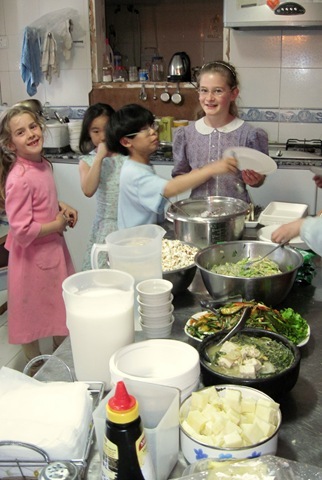 We enjoyed a very patchwork dinner, with Chinese and Korean dishes and American bread, followed by two cakes and homemade ice cream. We sang happy birthday in all three languages, and then in a combination: “Happy 生日 hamida, happy 生日 hamida . . .” I was here one year for Thanksgiving, and remember very vividly Timothy describing the origins of the holiday to Xiao Zhang. It was two cultures coming together to share their food – which is pretty much every day here in Hunchun. I ate my cake on the stairs with Xiao Zhang and Xiao Li, talking. They found out that I no longer have a boyfriend, and seemed more than a little bit pleased about it. I’m pretty sure that Xiao Zhang is already making a list of eligible Chinese husbands for me; he nearly told me as much! 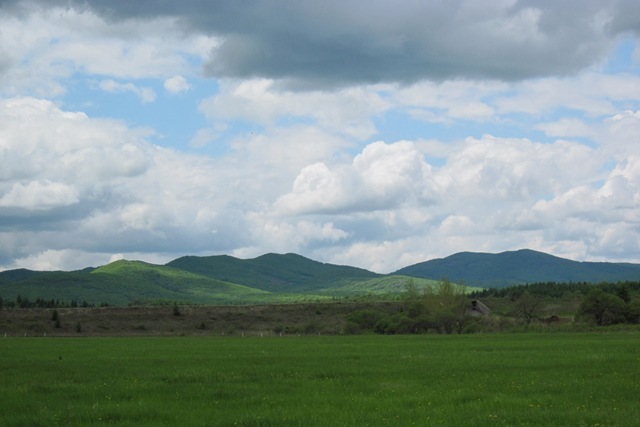 I found out that they were in Heilongjiang, the province north of here, when I called about a possible visit in February. 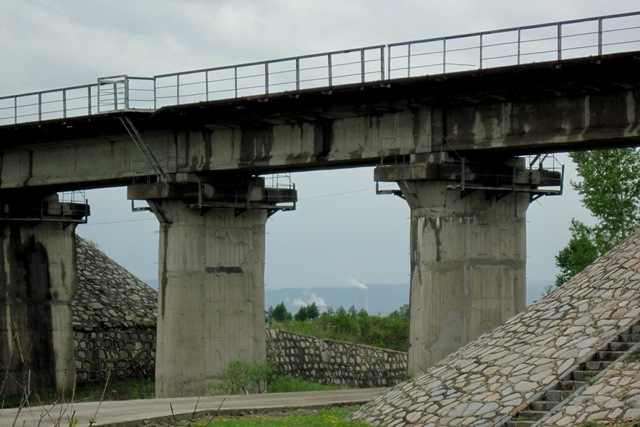 Once they heard of my plans, they hurried back to Hunchun – and then I didn’t make it. I feel so horrible about this! I really had no idea; their son sounded indifferent – indecisive at best – when I told him of my plans to visit after my parents left, so I didn’t worry too much about it until now. This is merely the latest in a string of incidents that illustrate how wonderful my friends are to me, and how I really offer nothing back to them. How am I even this blessed? !